magic - magic number. If less than 0, orders with any magic number are tracked. only_this_symbol - only chart symbol. If false, orders of any symbols are tracked. Max_total_open_transactions - maximum number of orders opened simultaneously. Slippage - acceptable slippage in points when closing trades (does not work in case of a Market execution). Max_Spread_Close_for_BUY - maximum acceptable spread when closing Buy (in points). Max_Spread_Close_for_SELL - maximum acceptable spread when closing Sell (in points). Close_for_Any_Spread - close trades in case of any spread. Take_Profit - take-profit. 0 - disabled. Stop_Loss - stop loss. 0 - disabled. Breakeven_Start - necessary amount of points from an order Open price for setting a breakeven. 0 - disabled. Breakeven_Plus - increase a breakeven by a number of points. Trailing_Stop - trailing stop value. 0 - disabled. Trailing_Step - trailing stop step. Trailing_Start - necessary amount of points from an order Open price for setting a trailing stop. 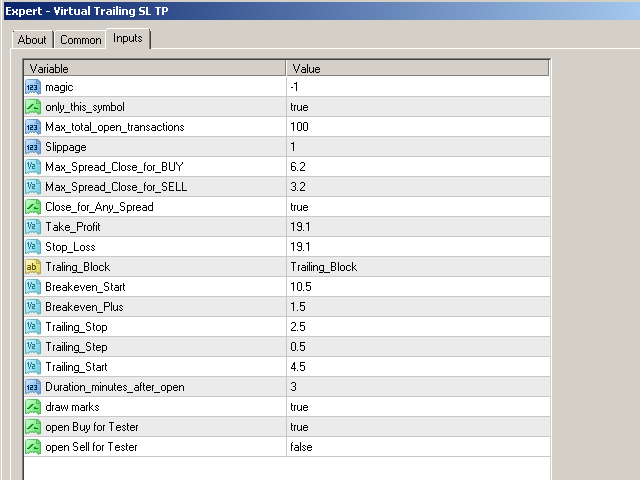 Duration_minutes_after_open - necessary amount of minutes after an order Open price for setting a trailing stop. draw marks - draws marks of levels on graphics. open Buy for Tester - open the transaction of Buy in a Strategy Tester. open Sell for Tester - open the transaction of Sell in a Strategy Tester. The lesser the Max_total_open_transactions value, the less memory is consumed by the utility. The utility now works both based on ticks and timer (every 3 seconds). ◾ open Sell for Tester.